Three friends have told me about the awesomeness of this particular project, and as I’m writing this it’s doubled its goal of $50,000 in just three days. 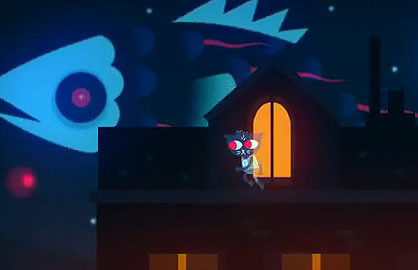 So, clearly, Night in The Woods is the fur-friendly kickstarter of the week. 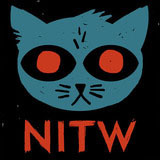 NITW is a 2D, sandboxy exploration-adventure game centered on Mae, a cat who’s returned home to a life of amiable, aimless anger in the dying mining town of Possum Springs, the town she grew up in. Things have changed. Things have remained the same. 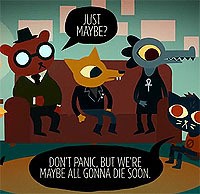 People have moved on, and just maybe Mae hasn’t. 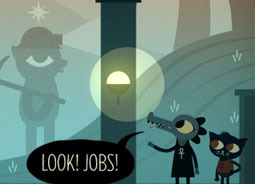 It’s a game about the end of the world, but if that’s the sleepy world of Possum Springs, Mae’s slacker existence, or the literal world, it’s anybody’s guess. 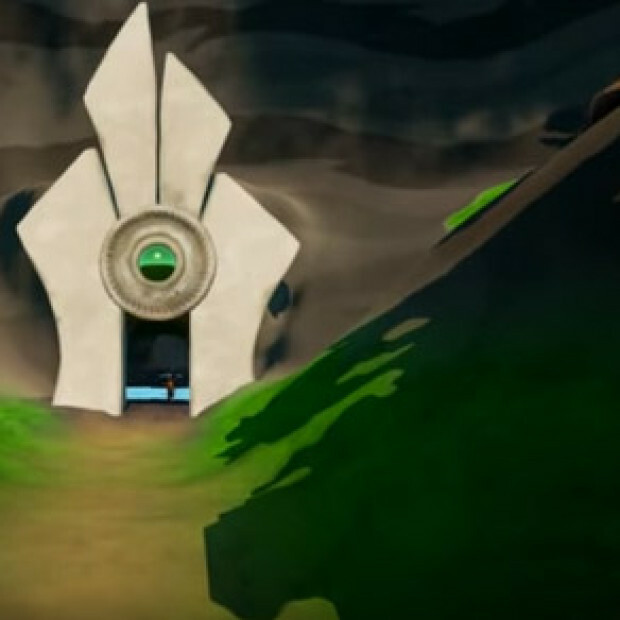 The animation style is simplistic, cutouts on a 2D background, but the world is complex, with a town to explore, a full cast of characters, a world that’s creepy and rich, itself just a bit strange around the edges (I’m reminded of the bizaare “anytown but thank god not MY town” of Welcome to Night Vale–in fact, the animator for the game designed Night Vale’s logo) with stranger things in the woods, and a dreamlike astral plane that Mae finds herself opening up to as the story develops. 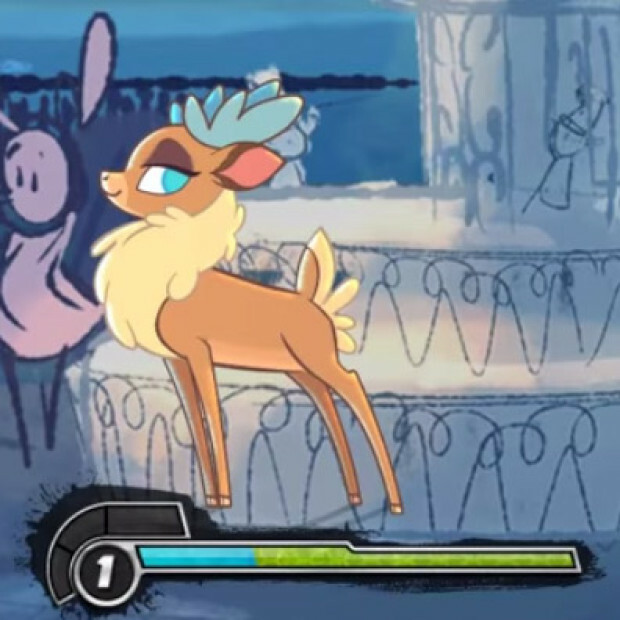 This looks like animator Scott Benson‘s first video game, and it’s off to a tremendous start. You can see some of his animation on his website. 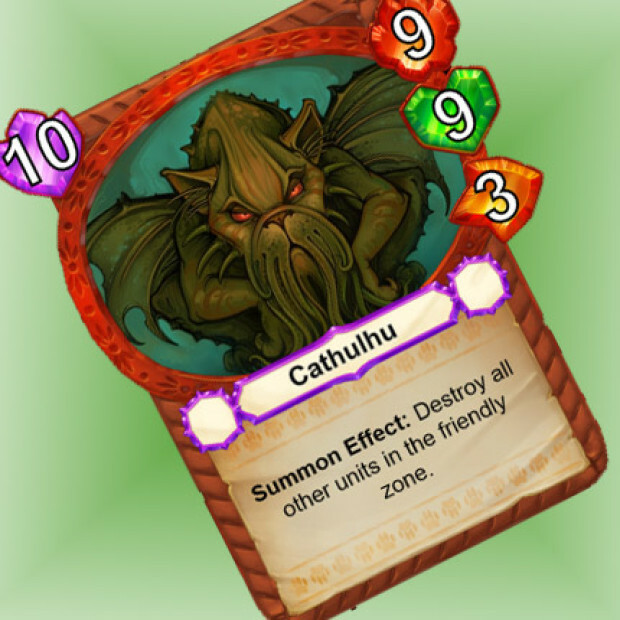 Producer/developer Alec Holowka has a somewhat larger VG portfolio, including another dreamlike 2D game, Paper Moon. Tim Burton, we’re waiting for you to produce the movie. Get on it.